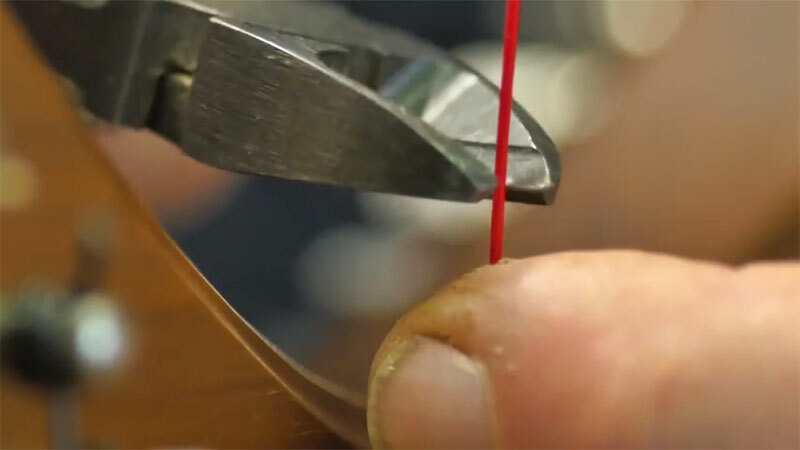 Every now and then harp strings break (to know more about why click here). 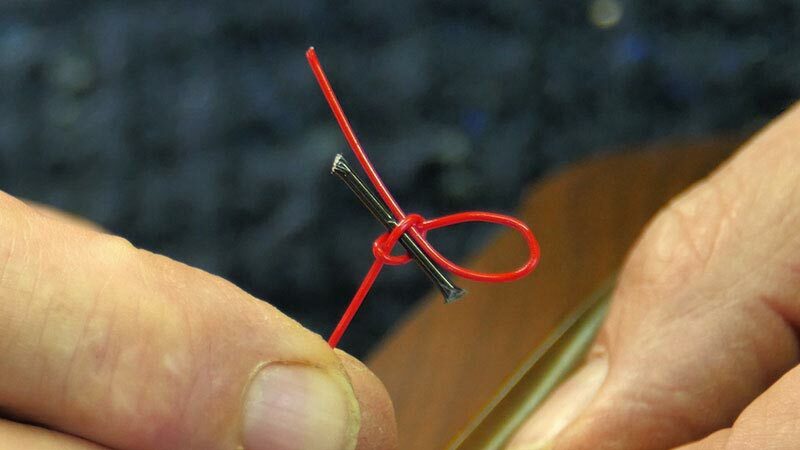 With a bit of practice, replacing a string is not very tricky at all. If you have identified the string which need replacing (if you aren’t sure check out our guide here), the next step is to remove the old string and put on the new one. To find out how to complete the next steps you can either follow Allan explaining in the video on the right or scroll down to follow the text and images. If you get really stuck, feel free to give us a call and we can give you advice over the phone! Before you start, make sure you have a long enough length of string! Usually, string suppliers will give you around a 4ft length of string which means you should get a few strings from a length in the treble and mid range, but in the lower bass end you will probably only get one. You will need the length of the string from the eyelet to the tuning pin, plus around 4″ spare for the knot and tuning pin. Begin by passing the string through the eyelet from the front of the soundboard and out through the back. The next stage is the trickiest – trying the knot! 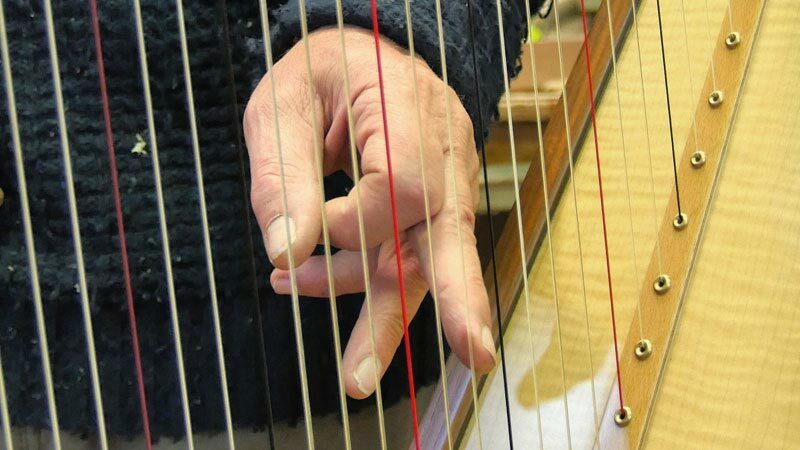 The knot used in securing harp string behind the sound board is called a bowline. The bowline knot is accompanied by am anchor (which you can make from a piece of old thicker harp string) to secure the knot in place and to stop it jamming. When it comes to knots, photos can sometimes be hard to follow so really the best way to understand the knot and tie system is to watch the video above. If you are still unclear about how to tie the knot you can find an even more detailed video and instructions here. 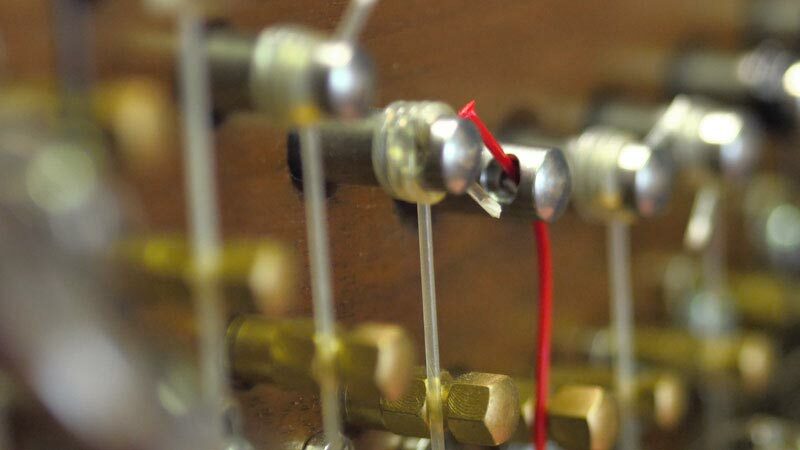 Following the creation of the knot, pass the string back through the soundboard. If your knot tying has been successful you should feel the knot and tie tug on the back of the soundboard. Next pass the string past the semitone lever (which should be in the open position) and past the bridge pin until you reach the tuning pin. Ideally the holes in the tuning pin should be facing down allowing you to pass the string directly upwards through the holes. You may want to prepare this position before you start threading the string. Pull the string until it’s taught. 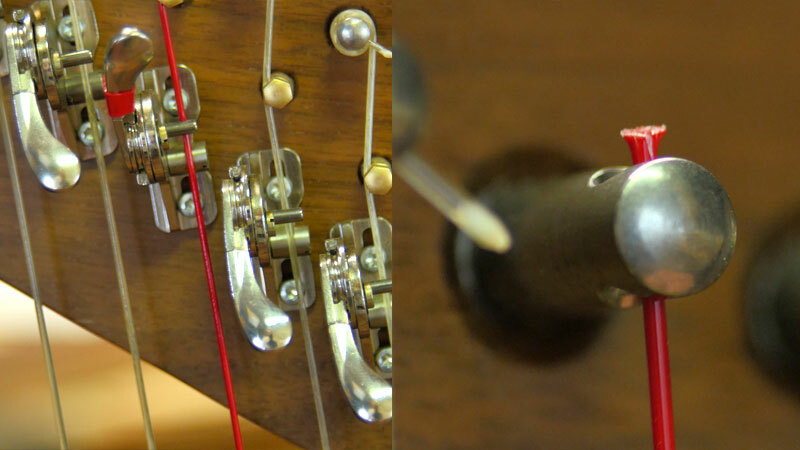 Continue to pass the string through the tuning pin until you have around 1 1/2″ sticking out the other side of the hole. This equates to about two fingers width which you can use as a guide. Snip the string with some string snips just above your fingers. 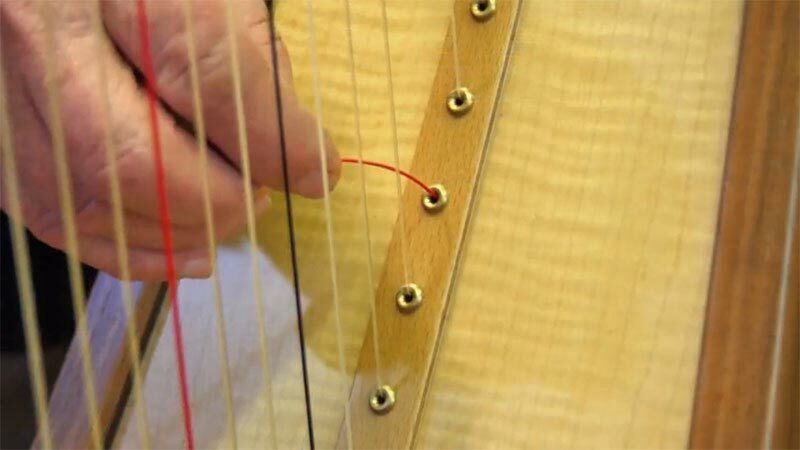 Pull the string back down so there’s around 1/4″ left sticking out above the hole and with your tuning key begin winding the tuning pin away from you (assuming you are standing behind the harp), gently winding the string onto the tuning pin. The additional winds should appear behind the hole (between the hole and the neck) and if you pluck the string as you turn you should hear the pitch begin to rise. By comparing the string with the same note an octave below you should be able to get a rough approximation of the string’s correct pitch by ear. A new string will stretch quite a bit initially and it may help to pull the string gently to stretch it further and help it settle in (don’t pull too hard though). Next, check that string is aligned correctly in the semitone lever and that the semitone is activating correctly. You will probably find that the pitch of the string drops for a while after it is put in (often for around a week, depending on how regularly you tune it), but if you keep bringing it up to pitch it will soon settle.